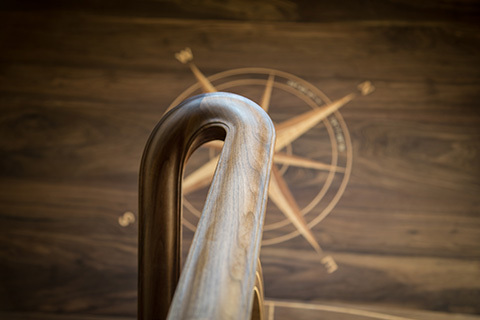 The Elemental Spine in Black Walnut with Stainless Steel and Polished Bronze rails that are the jewelry of this organic, sculptural design. 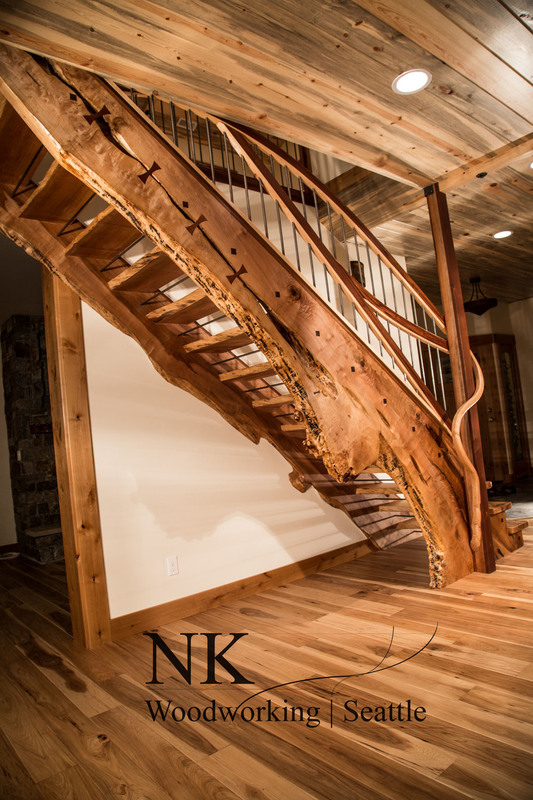 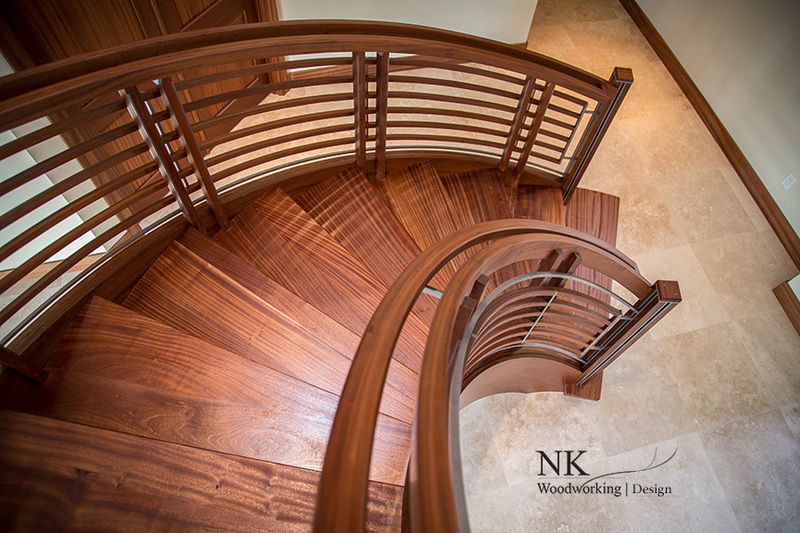 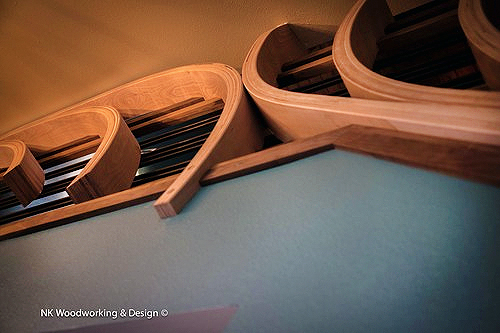 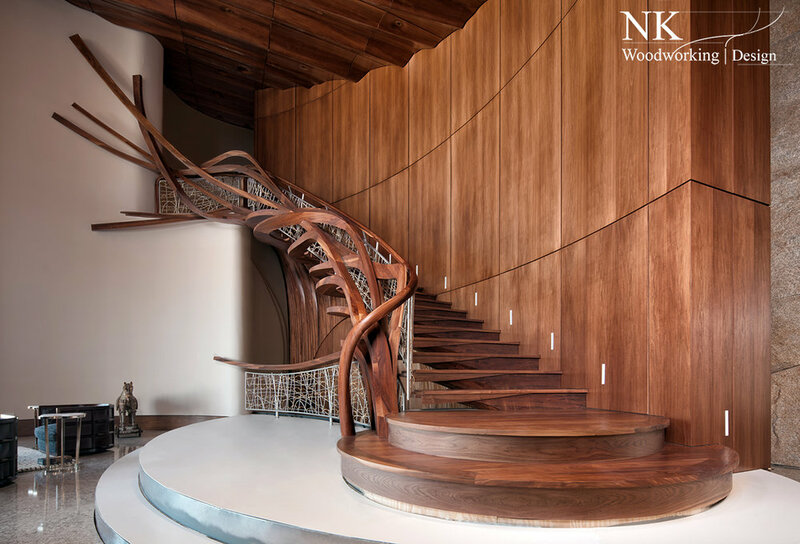 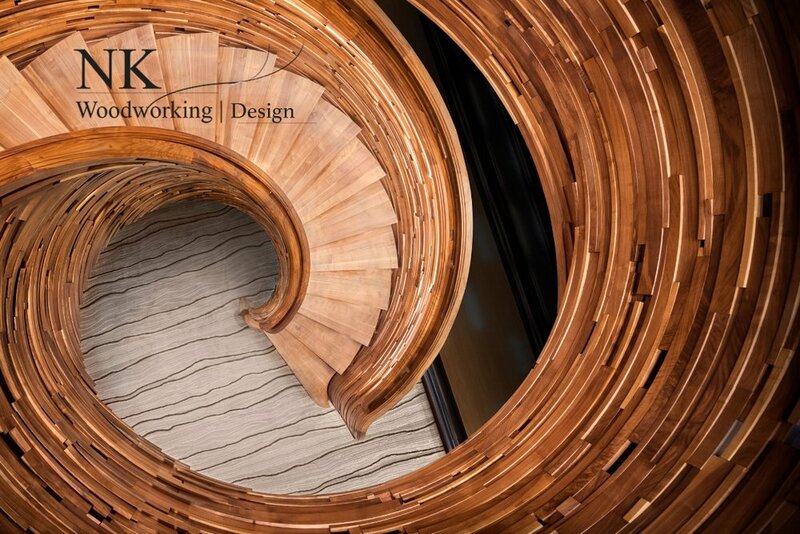 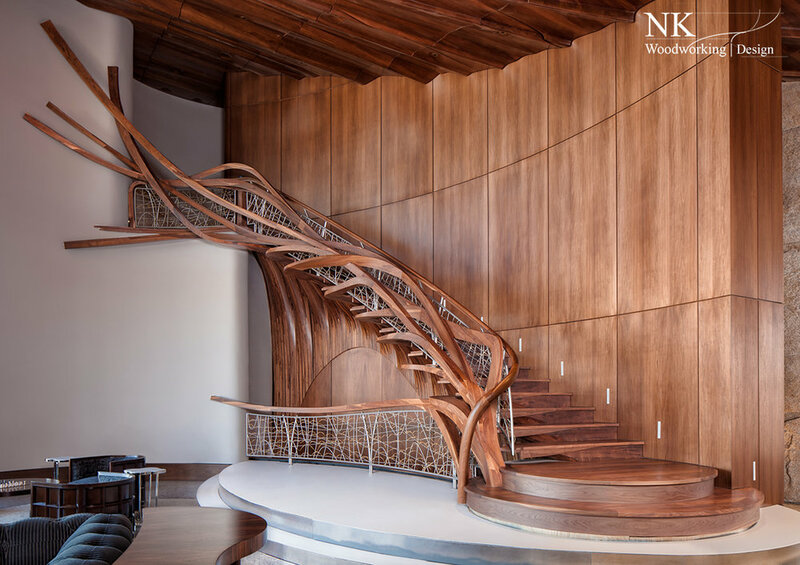 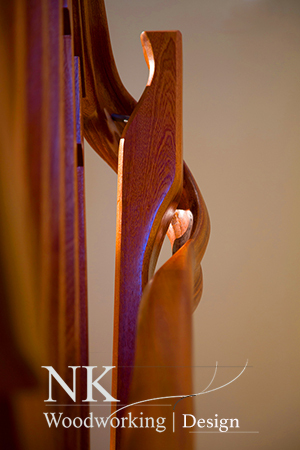 It grows out of the Walnut curved wall panels, also by NK Woodworking & Design, to become this one-of-a-kind work of art. 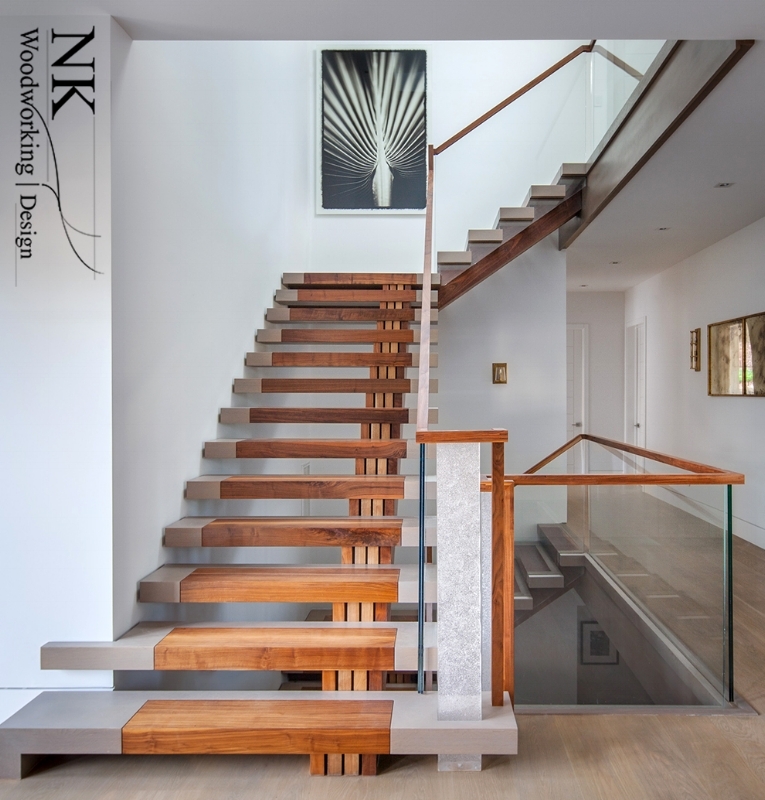 Walnut & ice, Designed by Nathie Katzoff of NK Woodworking & Design. 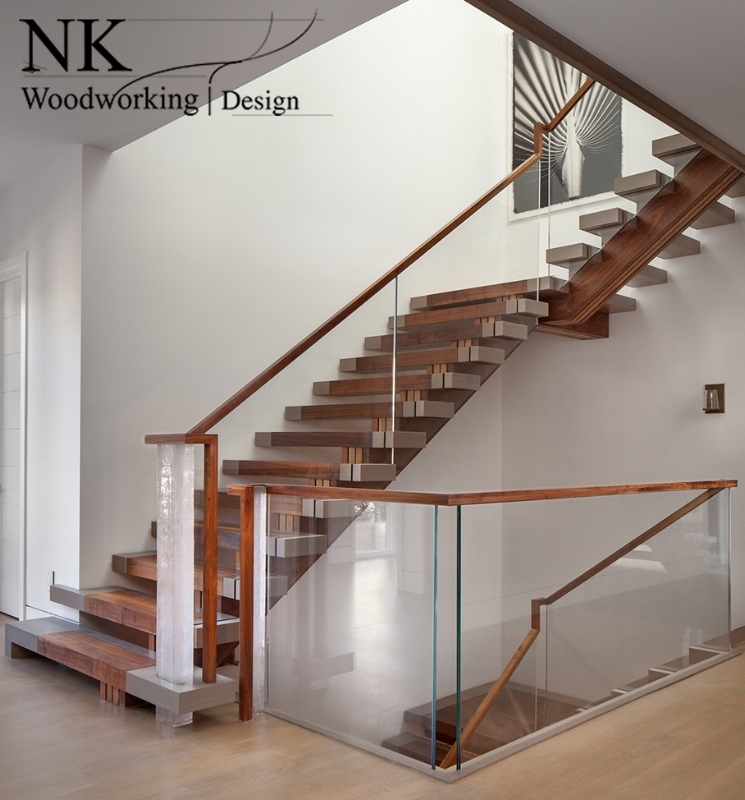 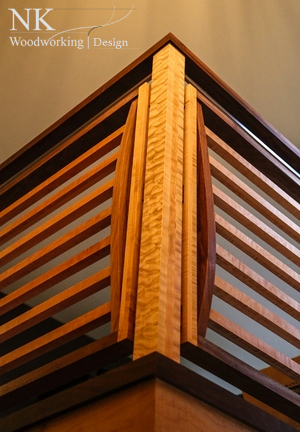 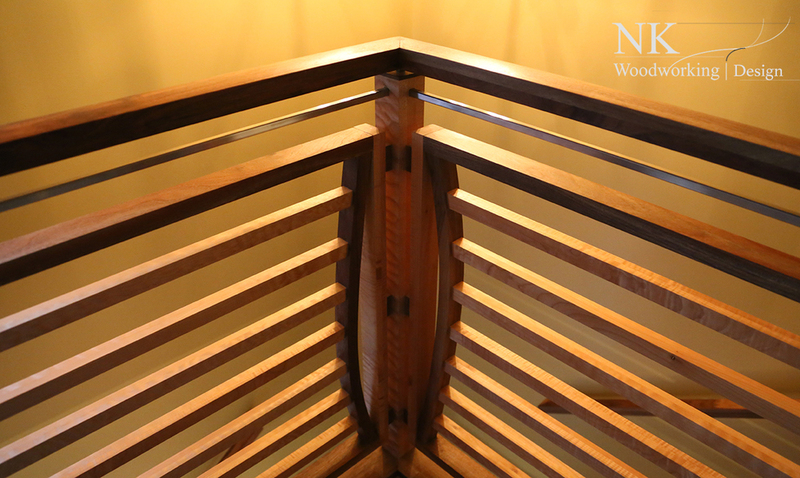 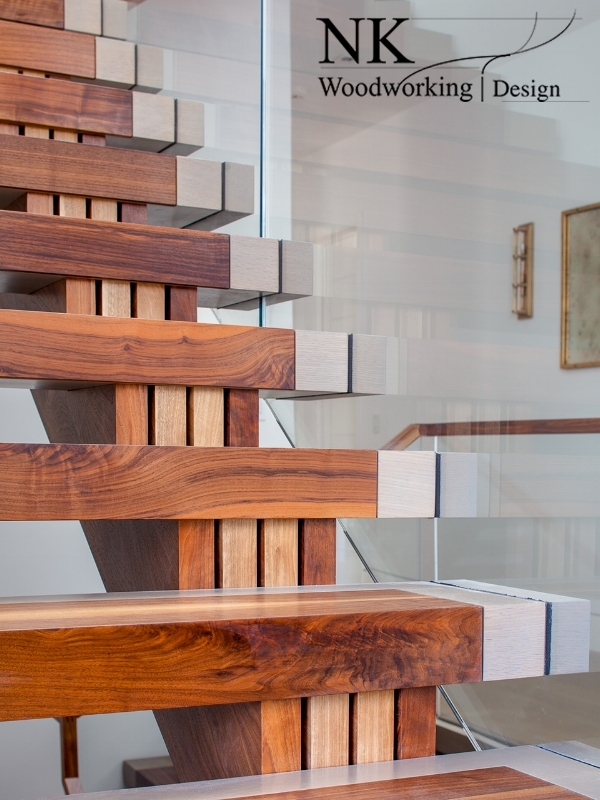 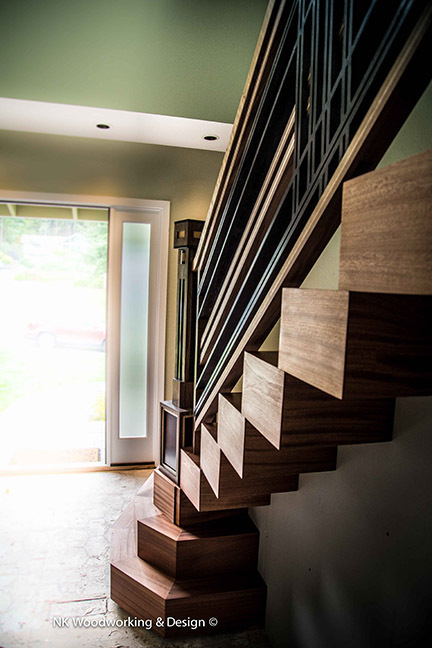 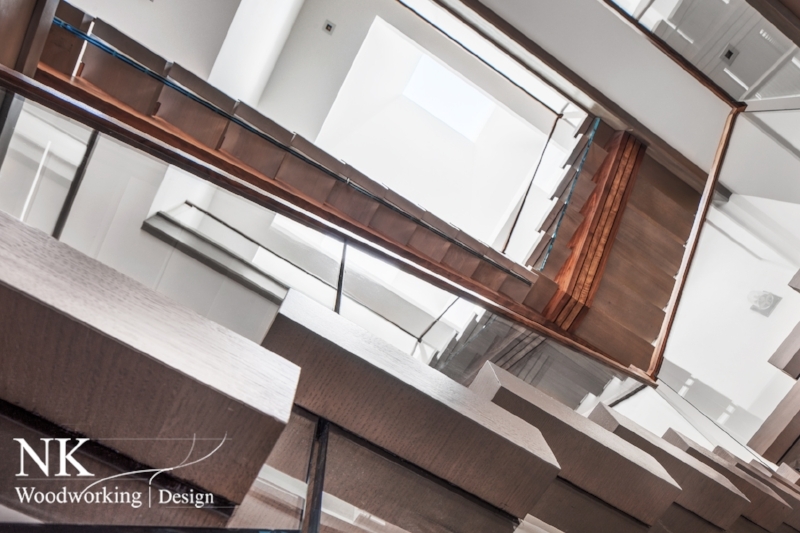 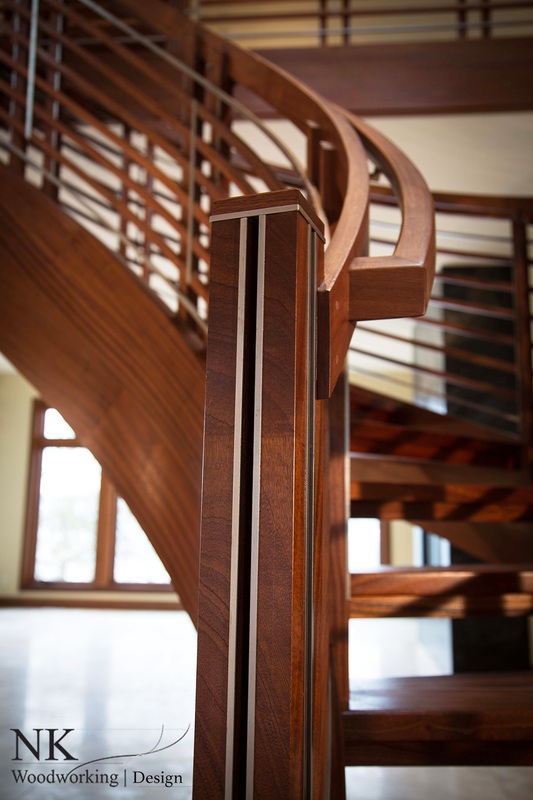 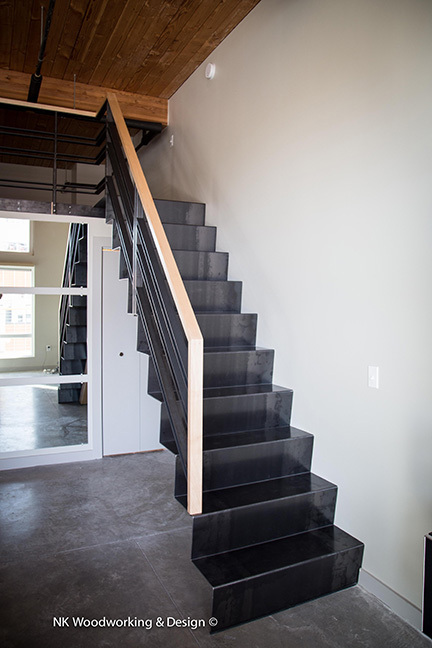 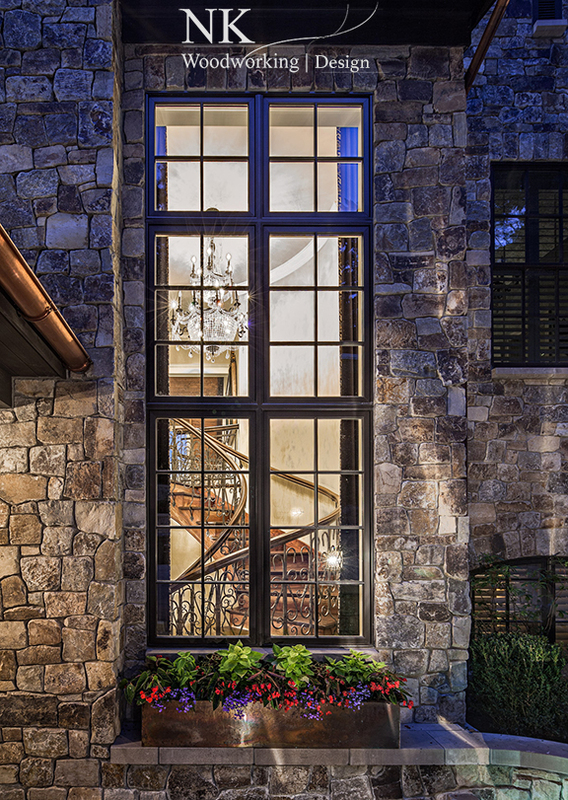 Materials include Black Walnut, custom stained White Oak, Art Glass newel posts and clear glass balustrades. 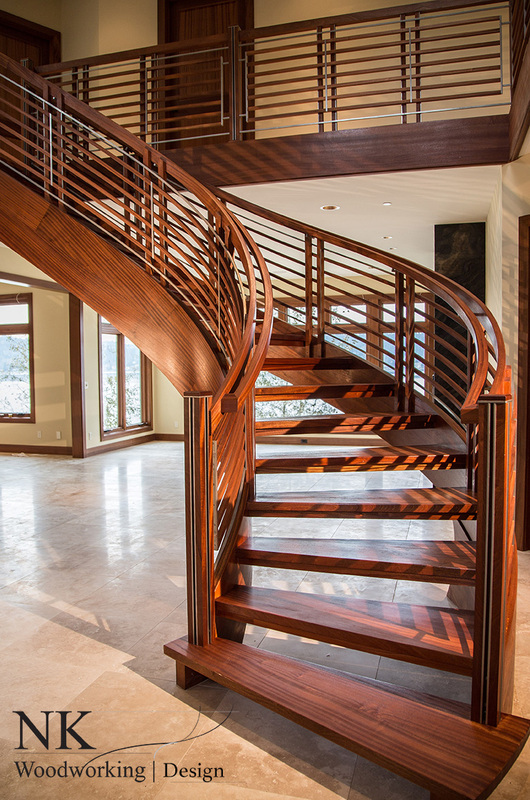 Located in the South Bay Area, California. 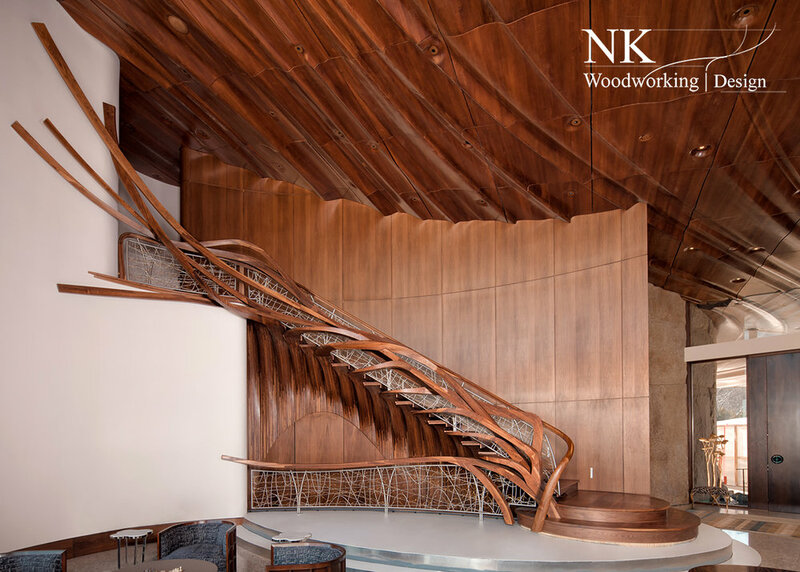 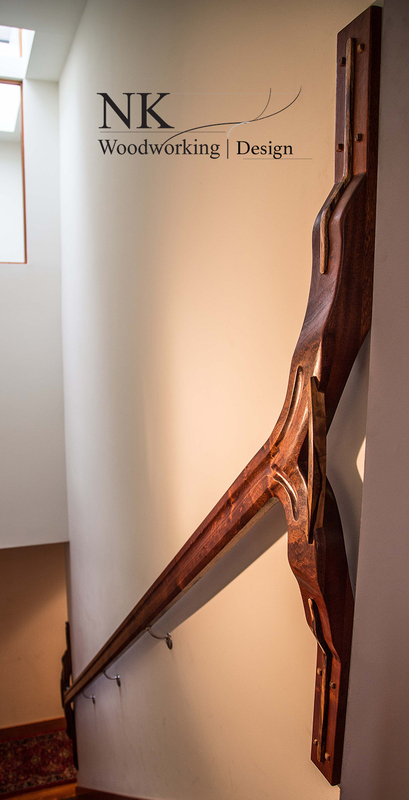 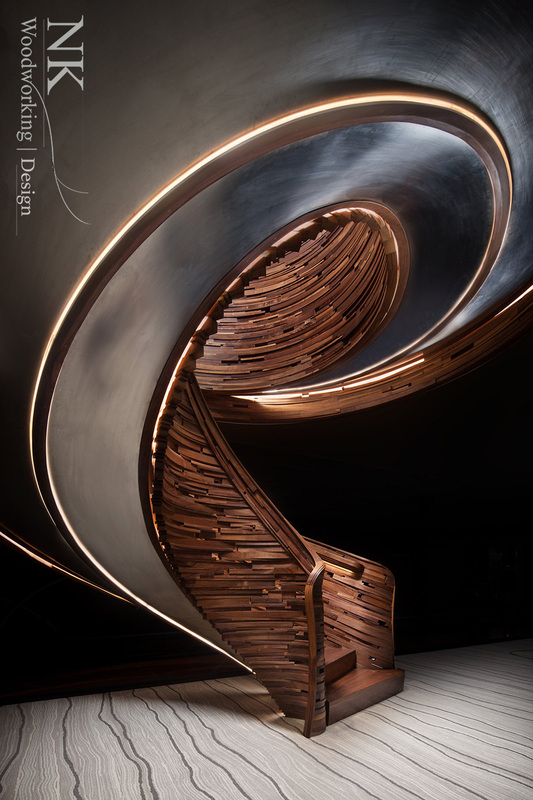 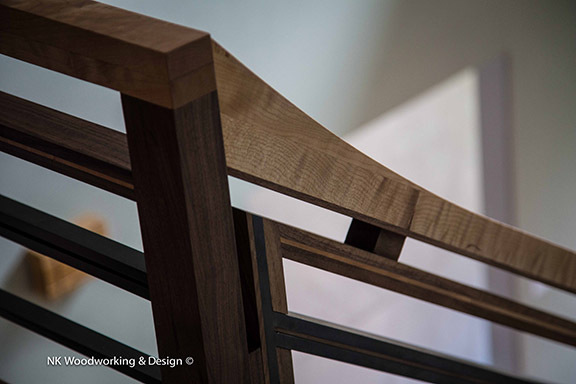 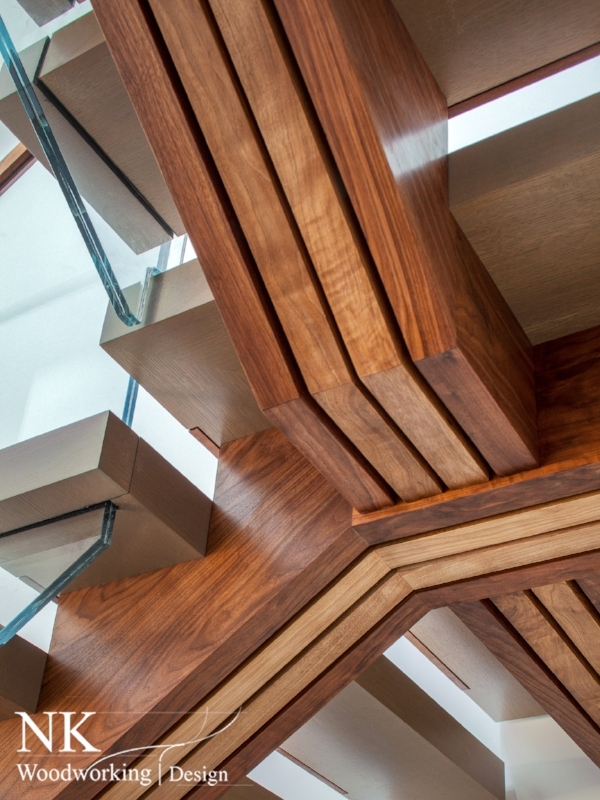 The Hive Staircase by NK Woodworking & Design - Comprised of individual Walnut pieces - hand shaped, sculpted and stacked - to create this organic rail design. 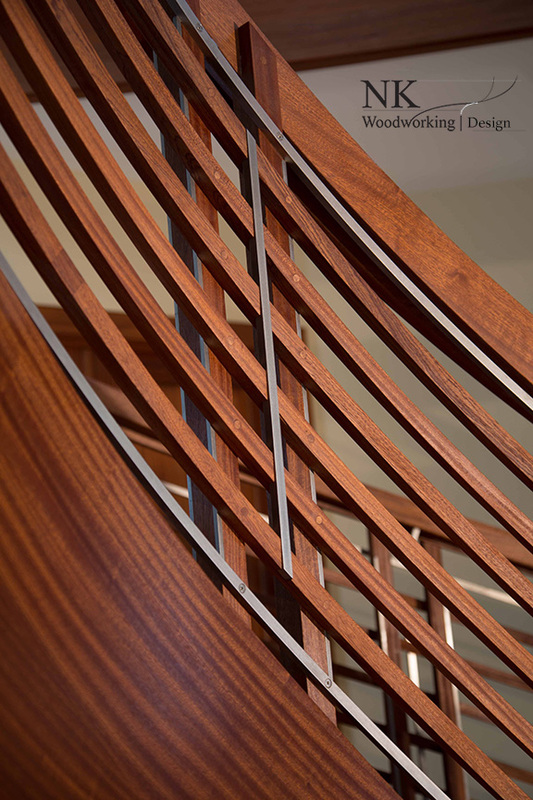 The soffit is formed to follow the circular design with a convex shape of brushed stainless steel. 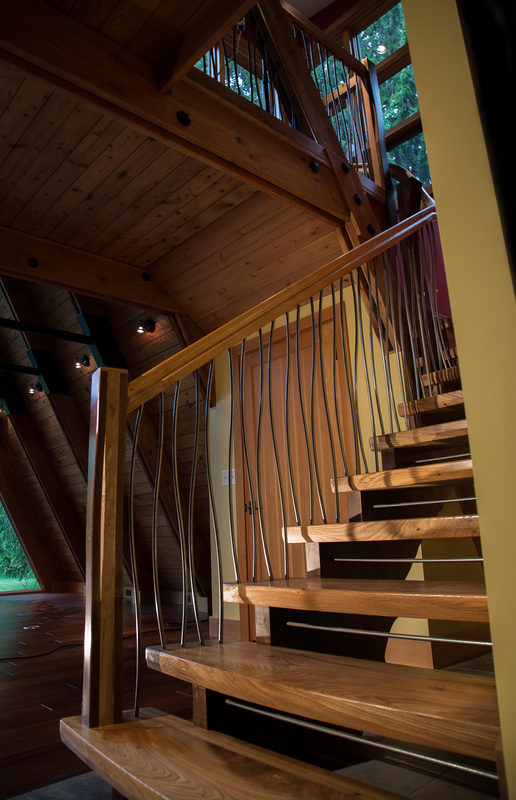 LED lighting details throughout. 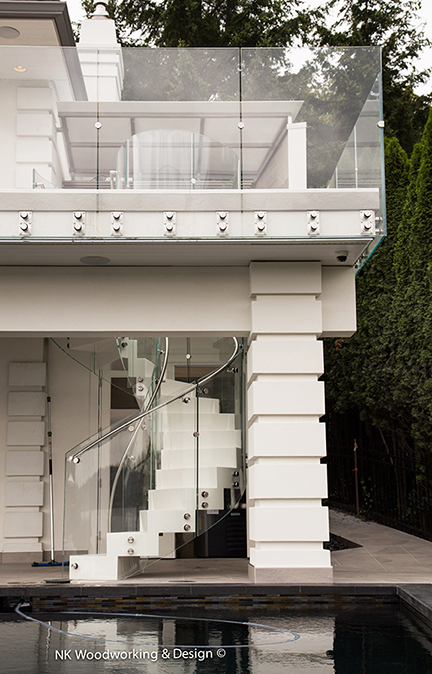 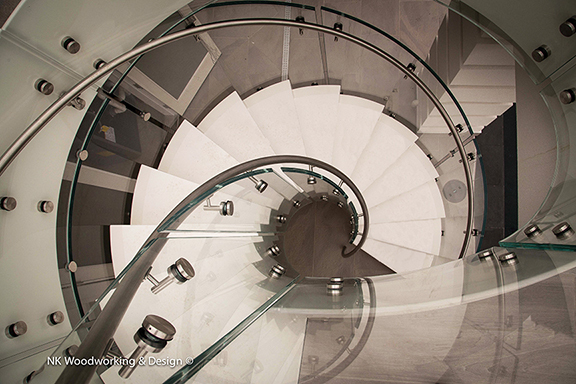 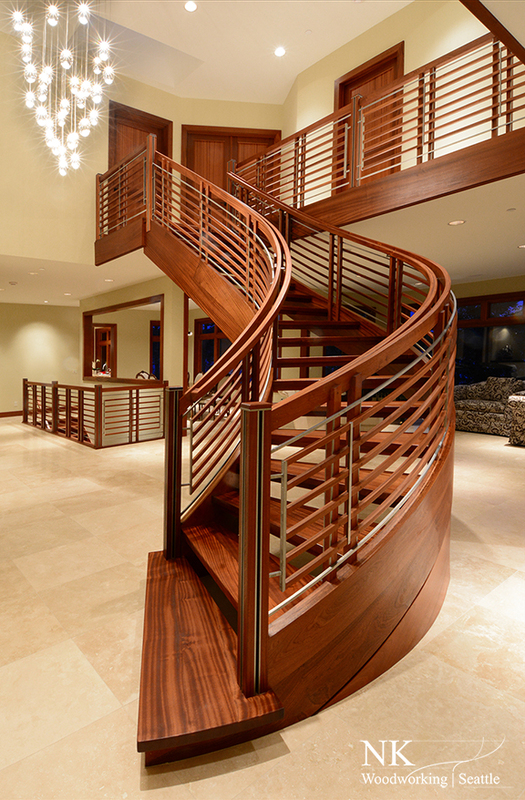 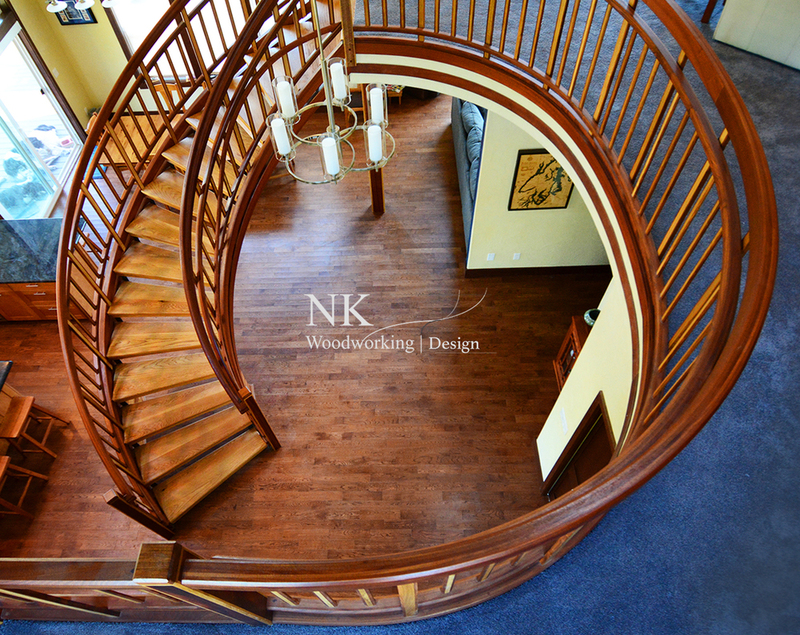 "White Chocolate" - Ultra custom floating spiral stair. 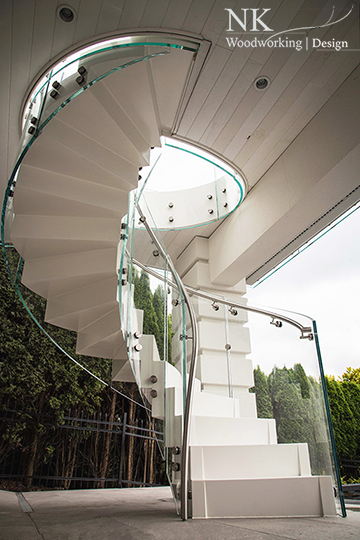 Featuring curved glass, and a minimalist stack construction steps. 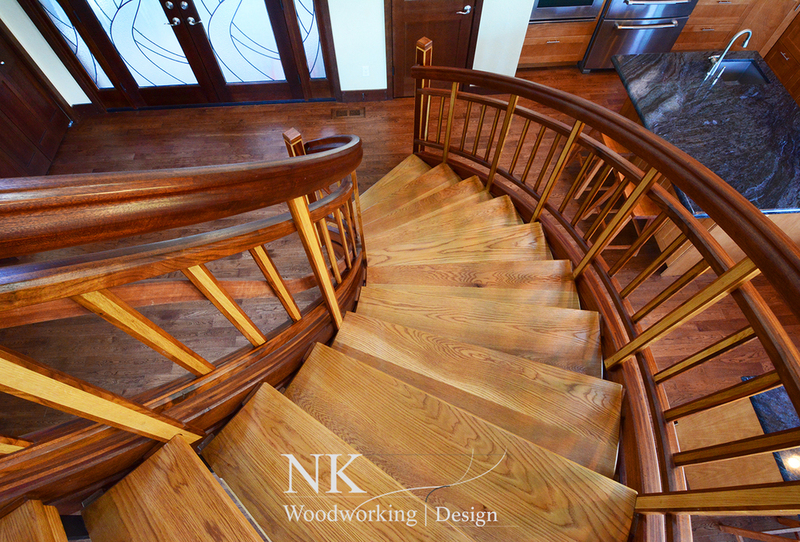 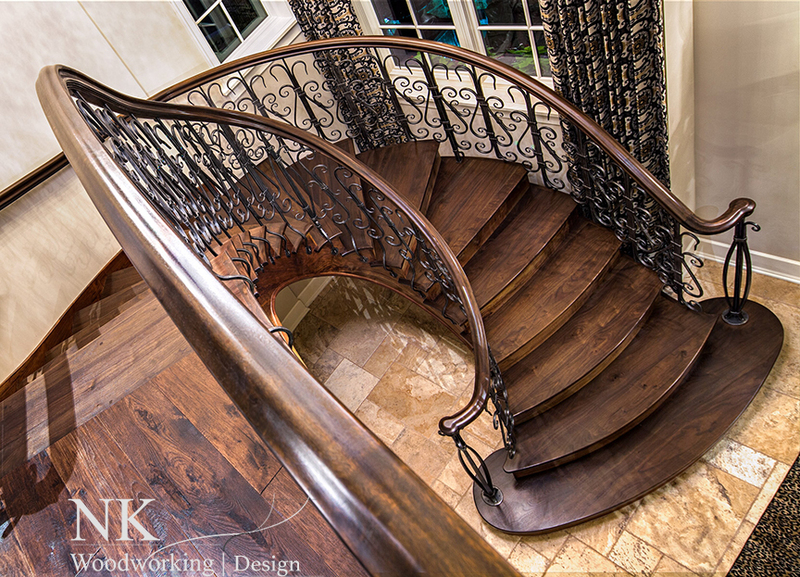 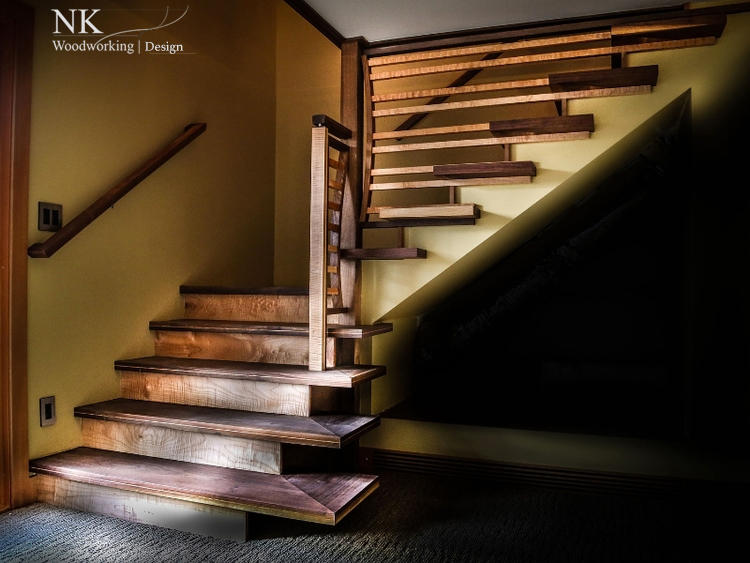 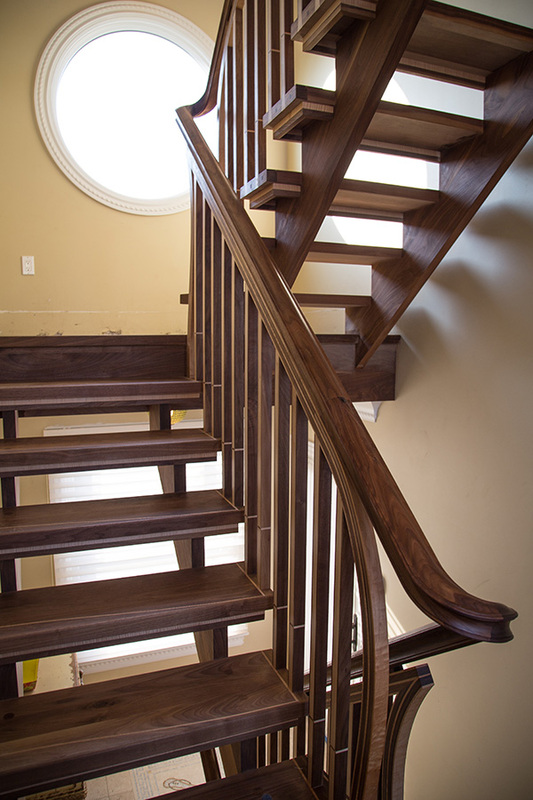 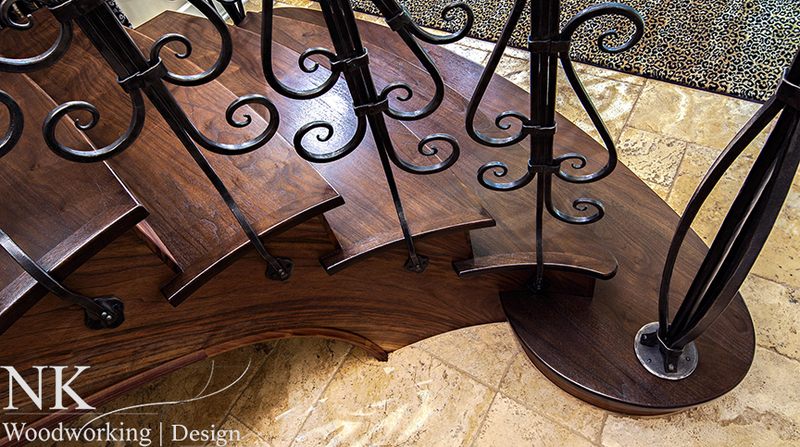 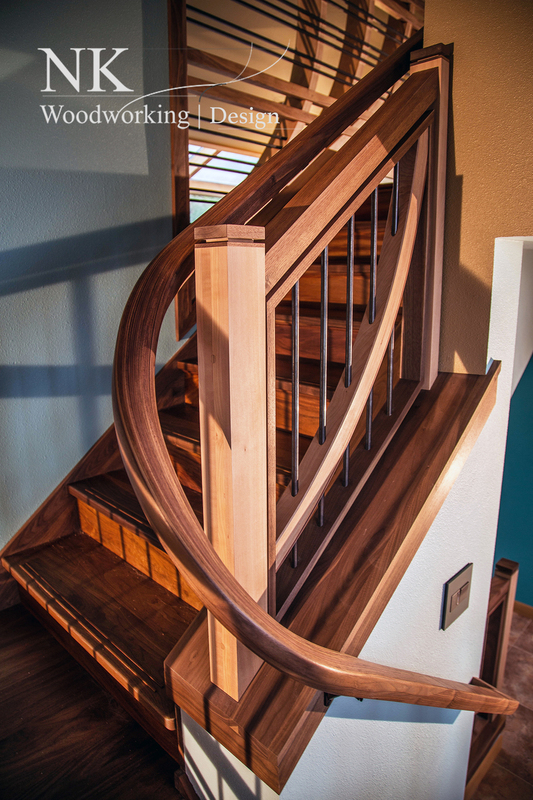 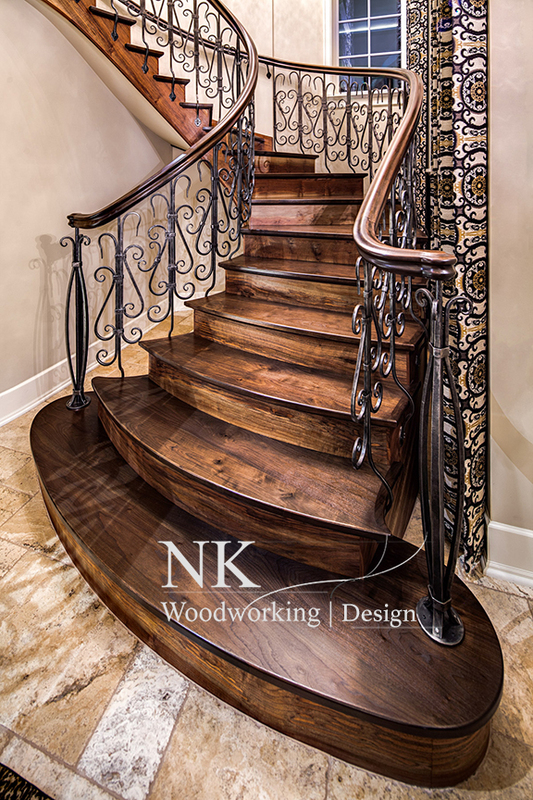 Floating, open tread straight stair with curved inlay design on treads; Black Walnut and Maple hardwoods; includes traditional joinery, inlay patterns, bending and shaping, hand-carved handrail profile, and inlayed Compass Rose at landing. 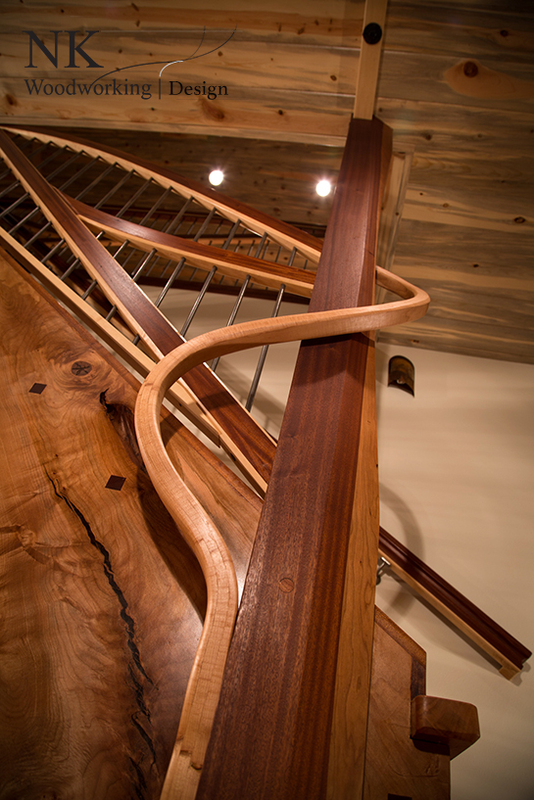 Composed of Dark Steel and Hard Rock Maple. 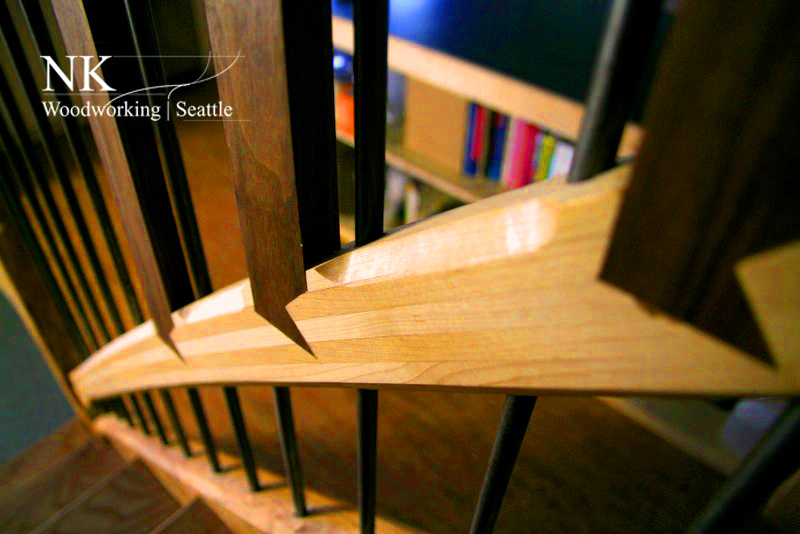 Installed in South Lake Union, Seattle. 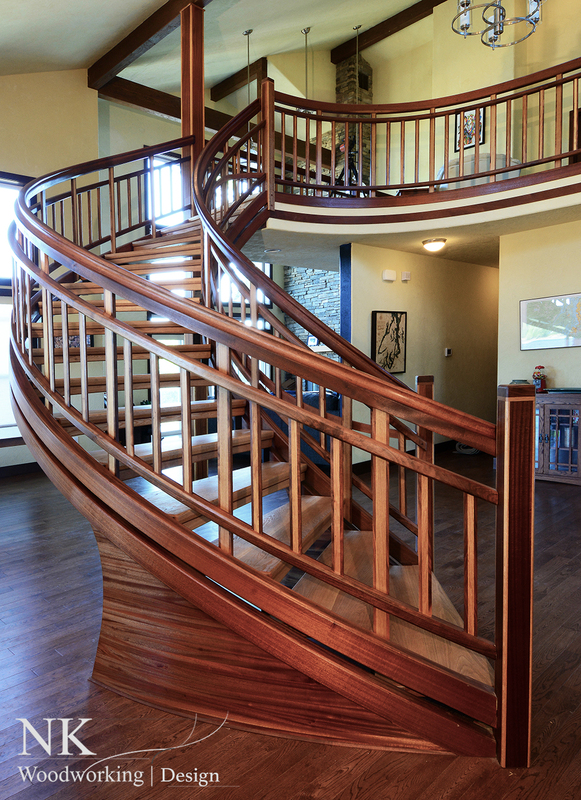 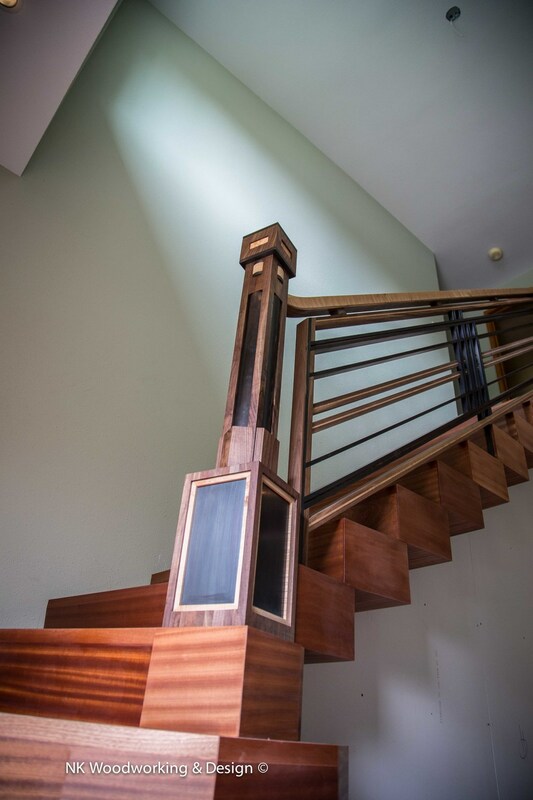 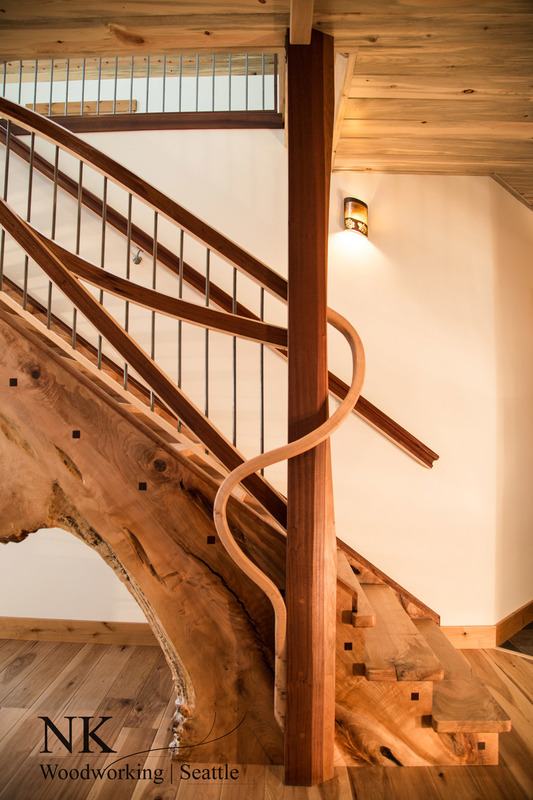 This original stair was built for a custom lakefront home. 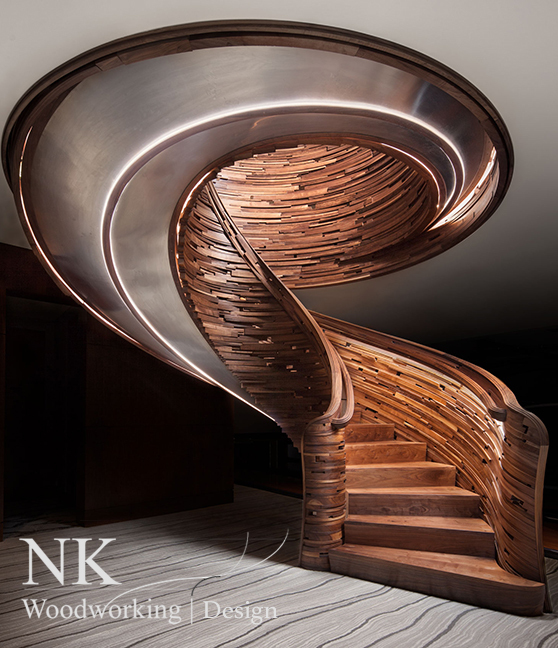 Nathie Katzoff worked with the client to design a unique take on a classic look and feel. 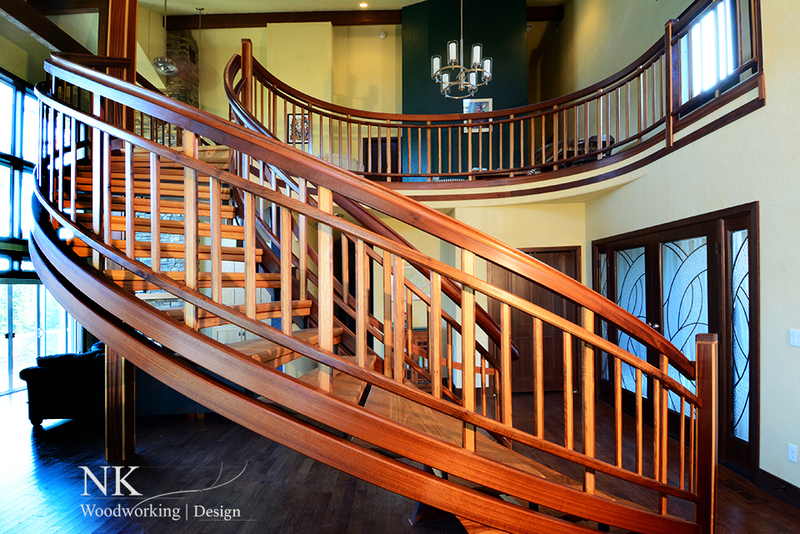 He was able to listen to what the client was imagining and proposed on the first try this stunning design. 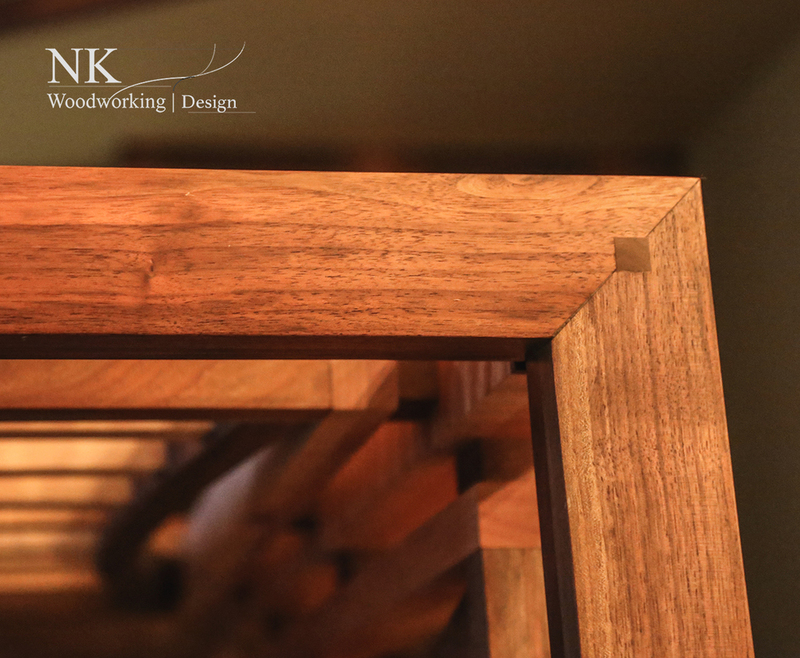 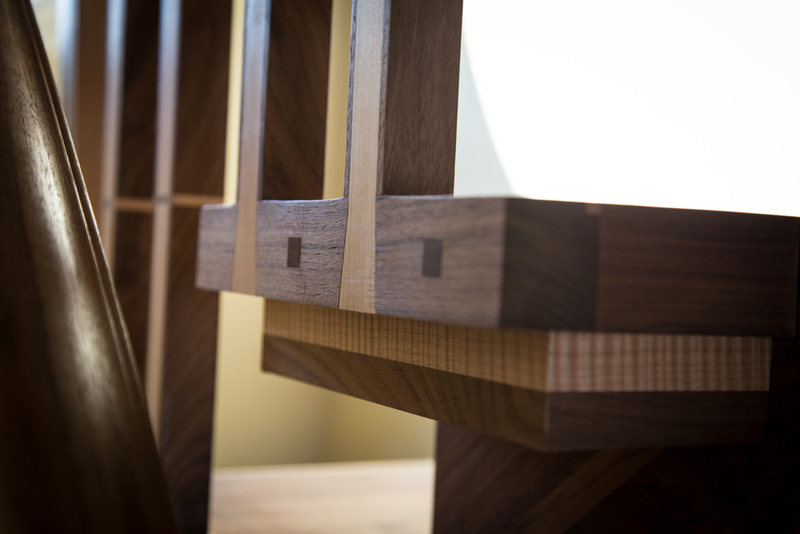 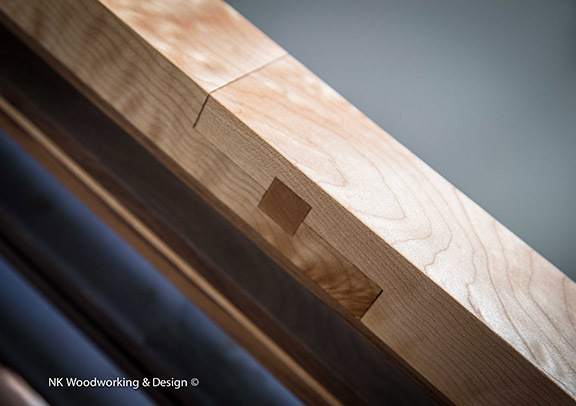 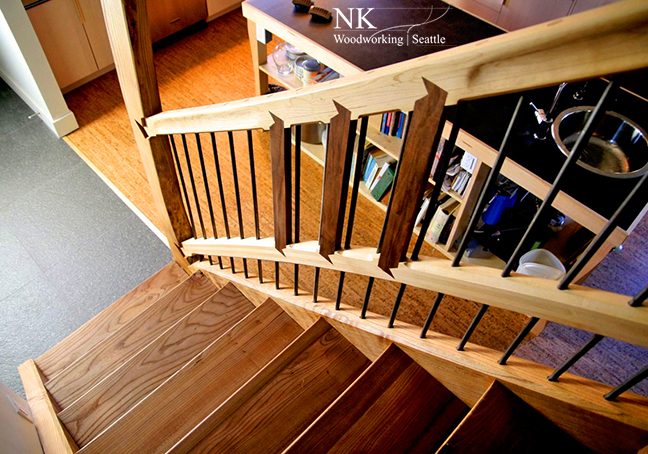 Handcrafted and forged in Seattle, WA by NK Woodworking & Design. 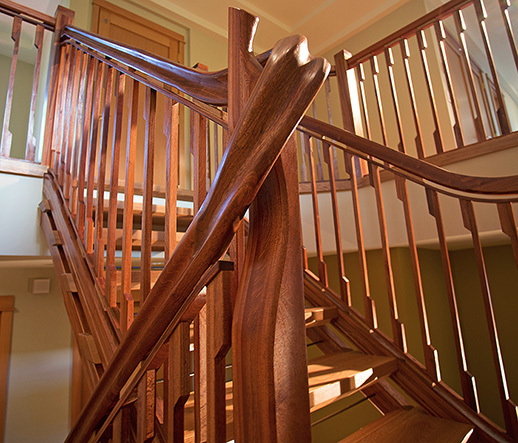 "Sweet Vine," a unique sculptural handrail composed of Curly Chocolate Hawaiian Mango and Sapele. 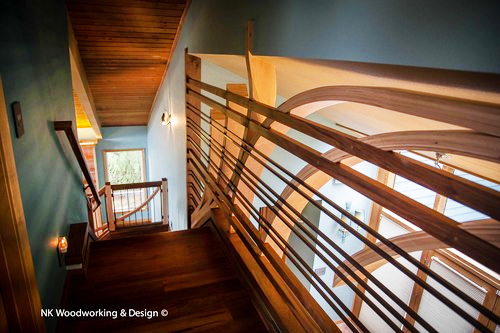 Our client asked for an artful handrail to make their Downtown Seattle condominium entry hallway something more than one floor to the next. 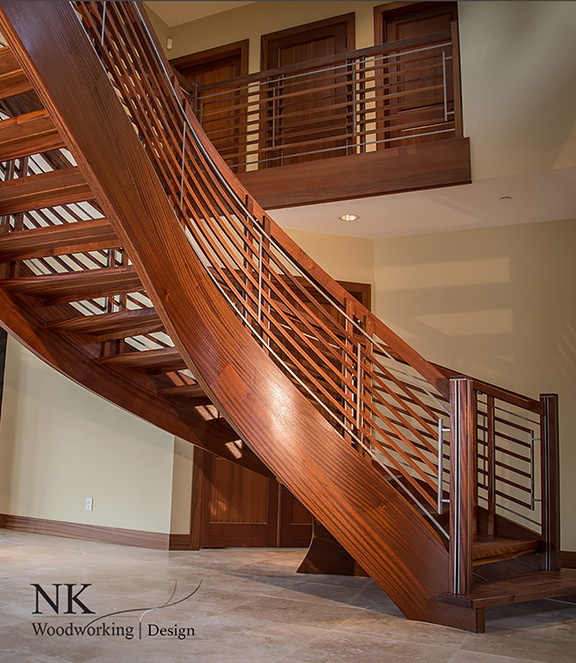 Over looking Puget Sound, this beautiful staircase is composed of Big Leaf Maple, Sapele Mahogany, Wild Cherry, and Cold Rolled Steel. 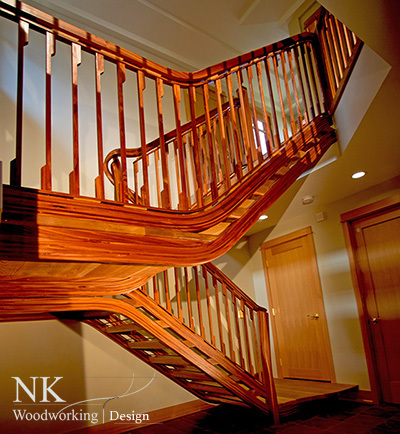 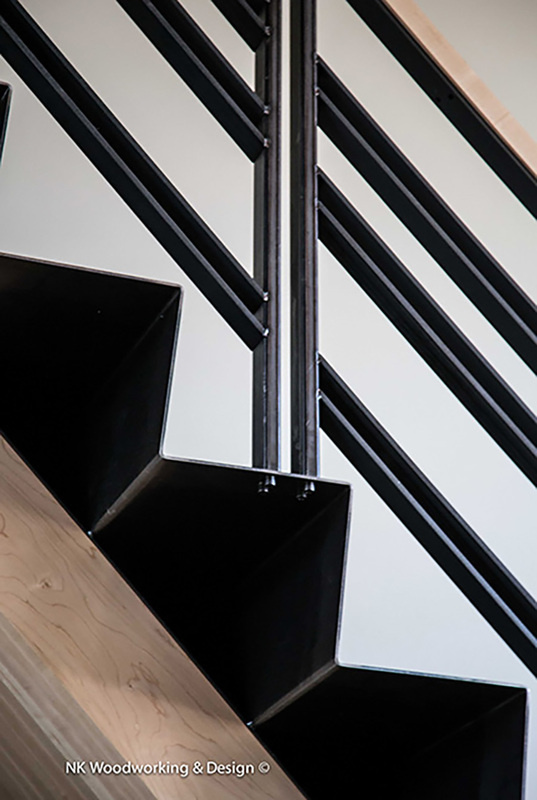 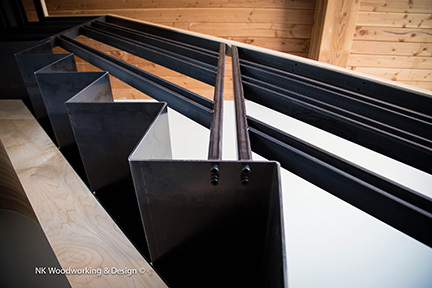 Winner of four 2014 design/craftsmanship awards: Washington Rex Awards for Design Excellence and Best Straight Stairway, Best Stair Part, and Most Unique Stairway from the SMA. 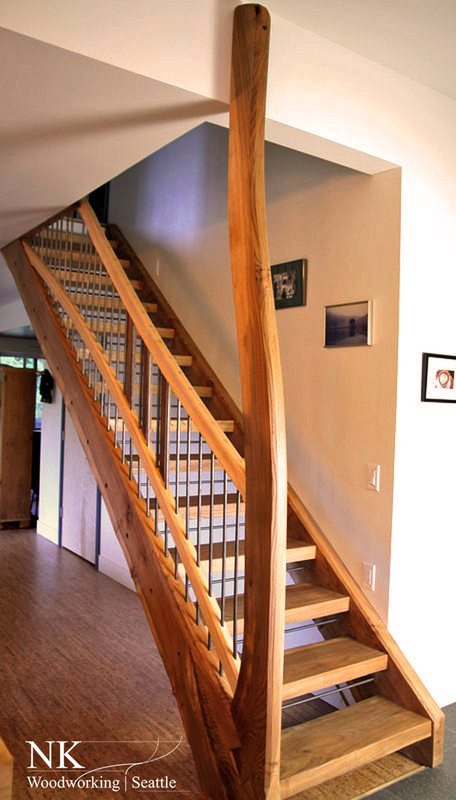 Awarded Best Straight Stairway 2013 by the Stairway Manufactures Association. 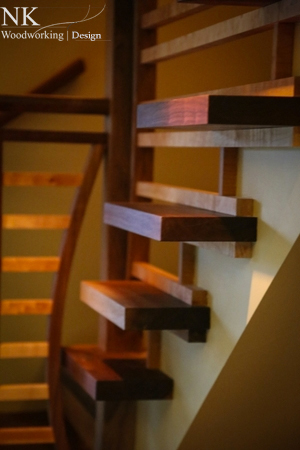 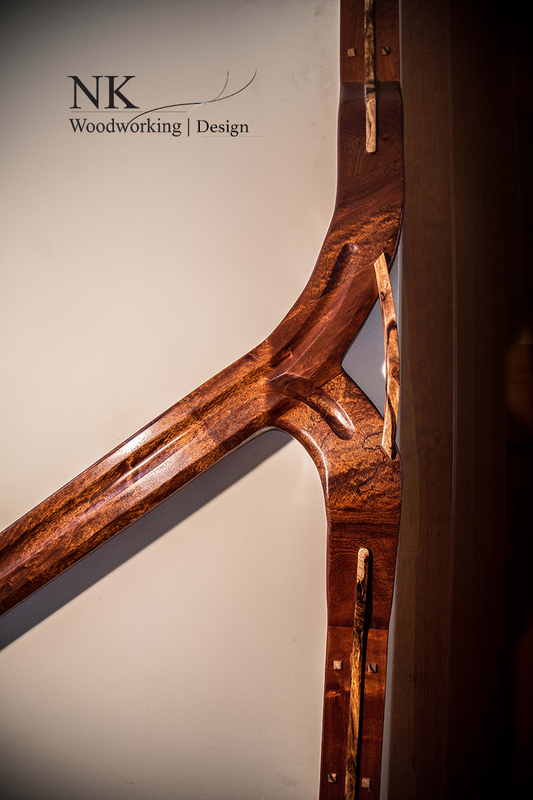 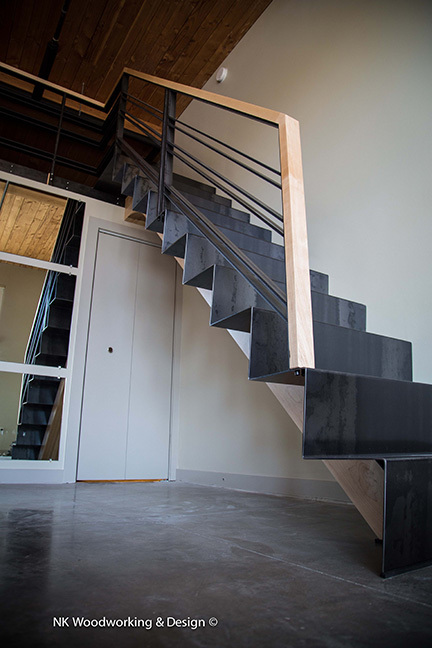 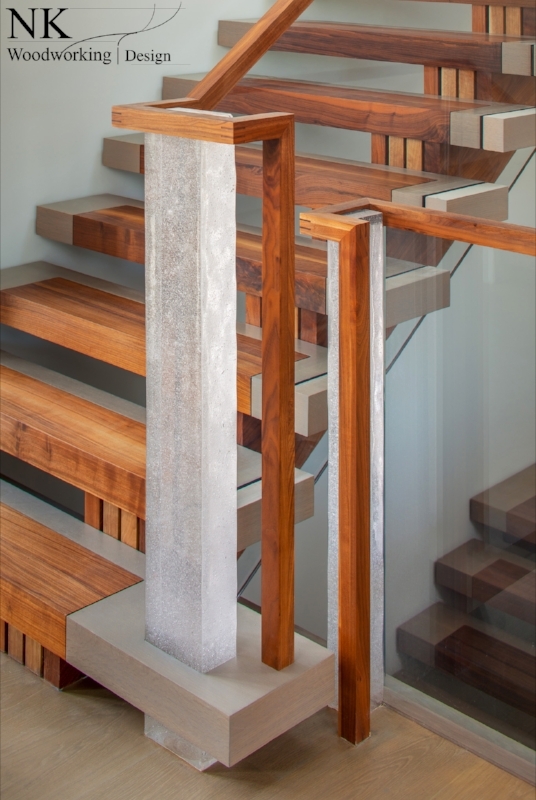 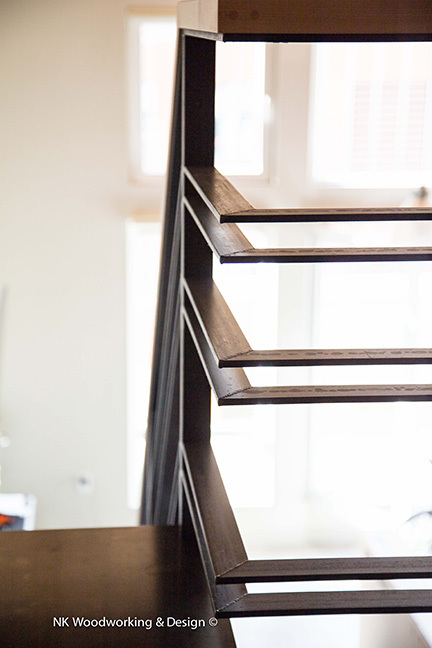 Custom Staircase composed of Madrone, Black Walnut, Olivewood and Bronze.